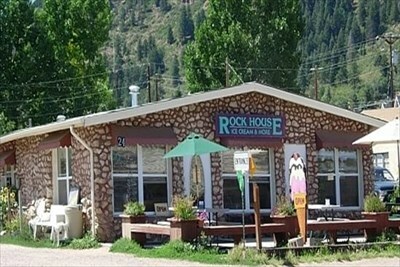 The Rock House – best ice cream in the Tri-Lakes area! Friday night I was sitting at The Rock House ice cream shop, enjoying a sundae with some members of our congregation as part of our Family Fun Week. In the midst of conversation, I suddenly became aware of a buzzing near the door. Something was going on. When I looked over, I saw the cause of the commotion. Waiting in line to get ice cream, were several firefighters from the Palmer Lake Fire Company. The Waldo Canyon Fire had been burning for almost a week, and had destroyed 346 homes and more than 16,000 acres at the time. Neighbors and friends had been evacuated, and many in Monument and Palmer Lake – the communities surrounding The Rock House – had been on “pre-evacuation” notice for days – getting ready to leave if the fire got too close. OK, that’s not really true. Everyone else wasn’t putting their lives on the line to battle that fire. What those guys were doing, and do every day, is extraordinary. But I was impressed with his humility. I thought about times I have enjoyed special privileges that come with being recognized as a pastor – moving to the front of a line, receiving a discount, having meals paid for, and the like. It is really nice, and I enjoy it, but I wonder if this firefighter doesn’t have something to teach. He was a servant to the very end. I want to be that kind of servant too.